British Airways is launching another ‘buy Avios’ bonus promotion today. Until 24th February you will receive 50% bonus Avios when you buy or gift points. This is as high a bonus as we see these days and there is no minimum purchase. The bonus kicks in with the smallest 1,000 Avios transaction. You need to visit ba.com via this page in order to buy. This is not necessarily a great idea as the best value is generally obtained by buying a small number of Avios to top off your account. If you saw me on BBC1’s Rip Off Britain last year (you can watch the segment here, it is only 3 minutes long) you will know that one of the members of the public I tried to help had bought 100,000 Avios for £1,600 without fully understand the restrictions behind them. In general, you will pay around 1.1p per Avios under this offer. Based on my spreadsheet of the last 7 million Avios I redeemed, I got 1.15p of value. This is using very conservative valuations for the flights booked, eg I value a Business Class flight to Dubai at £1,500 because even if BA isn’t charging that there is usually a deal with a secondary airline. I am clearly not a buyer at 1.1p. However, as my core article on ‘What is an Avios worth?’ shows, it is easy to get a lot more than 1.1p. My valuation is low because I do a lot of Gold Priority Rewards (using double Avios to force open a seat, mainly due to school holiday restrictions) and don’t always have a BA Amex 2-4-1 voucher to use. I also tend to use Avios irrespective of the value, because I am sitting on a lot of them. If you are strategic you should do better than me. PS. The current Groupon offer via Iberia Plus is still running too – see here, in Spanish but Chrome can translate. Compare the prices for the amount you want. Virgin Atlantic has now confirmed the rumour we published a few weeks ago. Flights to Tel Aviv will launch on 25th September. It will use an A330-300, so Virgin’s fully flat Upper Class seat will be going head to head with the Boeing 777 version of the Club World seat. For the first month, the flight will leave Heathrow at 13.30, landing at 20.35, with the return leaving Tel Aviv at 07.15, landing at 11.10. This changes from 27th October, when the departure from Heathrow moves back to 16.00, landing at 23.05. The return will depart at 06.05, arriving at Heathrow at 09.55. Somehow this had slipped past me. When I was in Venice last August I noticed that Marriot’s Westin Europa & Regina was closed for refurbishment. It appears that the hotel is about to reopen under the luxury St Regis brand. 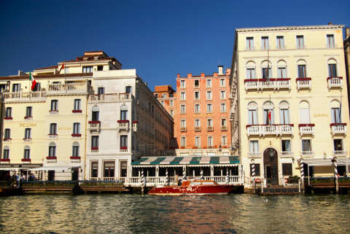 This will make another excellent Marriott option in Venice to add to the JW Marriott (on an island outside Venice, JW Marriott Venice review here), the Gritti Palace and the Danieli. Booking is not yet available. The website says March 2019 but that is not probably happening if you can’t book yet! You may remember that St Regis used to have a hotel in the lagoon, next to the JW Marriott, but it closed after a year and was rebranded as a Kempinski. The hotel website, not that there is much on it yet, is here. Virgin flights to tlv- when will it be available for booking? And can award flights be made using virgin miles? 25th February is the dates bookings open. No info on award flights yet, but assume will be made available on the same day. Do you know how many miles it might be or should we just wait? Just looking at BA taxes… significantly higher than cash rates on Easyjet (+ legroom and lounge) before we get into the value of miles. Debating if CW/UC is worth it for 5 hours. Trick is to fly outbound cash and return using miles – no fuel surcharge makes return around £40-50 in taxes. If Israel are in Eurovision and UEFA then surely BA RFS pricing should be applicable shouldn’t it??? By the same justification given that Australia are in Eurovision too same should apply to flights there! OT – re the questions recently about what Marriott/Bonvoy will charge for points bookings made in advance for properties which change rates between time of booking and the certificate being issued (eg. new Cat 8 hotels). They’ve changed their policy from 5th March. If you haven’t got the certificate issued by the time the points rate changes, you’ll be charger the new (higher mostly) rate. Key bit in the T&Cs is the bit about ordering the certificate. If you don’t have enough points to order the certificate by 5th March then you’ll have to order a certificate after 5th March at the new unified program rates (which are mostly higher) even if you’ve booked before then. You got there 45 mins before me on this. It was on OMAAT yesterday. I was thinking that wouldn’t impact me as the hotel I’ve booked wouldn’t be changing category, however the dates I’ve booked may become ‘peak’ dates as we have no idea when these are yet? Will sort the points out ASAP and order a certificate! From what I’ve read, peak/off peak is coming this year but not being introduced with the March award chart. But of an underhand sneaky move though if they don’t end up rowing back on these points advance changes. Many people will have made (perhaps non-refundable) travel plans around bookings that, with less than a months notice, have now shot up in price. The prior precedent was that calling CS would correct such bookings to the lower value. Not saying Points Advance was perhaps too generious in its previous form but a poorly implemented/underhand move from Marriott. Thanks 🙂 I was going to risk it but now I will delay my points transfer to LH for a few month and book hotels I want with points now. I hope they don’t devalue airline transfers in the interim. Has anyone had any joy increasing their certificate category with points? Yes, I managed to upgrade my TP certificate when converting it from old to new. Wow, thanks for the heads up! This will impact my booking to Domes of Elounda this year. I better get some MR points over ASAP to make up my shortfall. Me too – have a gritti palace booking for later in the year – might need to take some action to lock it in asap! The very first time I flew to TLV for work I was advised to fly El Al…whether true or not, I was told it was easier to get through security at both ends. After that I flew BA….although, I have to say, I really enjoyed my flight on the way back – I got an entire row 2-3-2 to myself! Unlikely flying on LY will make a difference. If anything it will cause more problems when flying into TLV as LY use Israeli security checks for inbound as well. The best way to keep under the radar in TLV is by not having weird (by their standards) stamps in your passport, and answering all questions truthfully and with a straight face. Let’s not beat about the bush. Weird = predominantly Muslim countries. I was selected for enhanced screening due to all the stamps in my passport. Apart from that, great country. They profile based on risk. I know people don’t like to hear it but over there the risk is mainly from people who visit those countries. Early starts to connect to US flights. El Al doesn’t have that issue. I believe the thinking was that VS are going for the connecting market from the USA – I think their press release mentioned something re this. Yes, in theory it feeds to US departures. I am guessing it will work out. Might even be a bit of a TP run. That is not true, as BA also have a 4 PM departure to London. I think he’s referring only to the morning flight, which is for connections. BA does move theirs around a bit, anywhere between 7.30am and 9.30am. EasyJet actually have the most decent timings for the leisure traveller..
OT just hoping someone can check my logic on a planned points transferral – hope I haven’t missed anything! Husband has 16,000 MR which he will transfer to his SPG account. He will then call SPG and ask to transfer them to my SPG account (free of charge transfer). Combined with my SPG points I will have 60,000 SPG points to turn into 25,000 AsiaMiles for my account. Can I just check there are no rules for MR points going into SPG being only limited to being used on hotel redemptions? And no restrictions on SPG transfers based on age of account (like Iberia)? Hopefully my plan will soon come together very soon! I booked 2 seats outbound with 241 hoping dates for my inbound would come available and would add to my booking. This was NOT 355 days in advance. 3 months or so, just there were no inbound flights available. As soon as inbound flights came up 11pm I booked them using Avios in full for 2 seats. Next day during office hours, I called hoping to add them to my outbound booking and benefit from a) 241, get half avios back for inbound and b) get refund for tax as the 2 separate bookings cost more in tax than had I done both legs in one booking. CS were very helpful but said they usually can’t help, but only seeing the time I booked and understood what I was doing they would review and get back to me. CS called later that day saying that they can’t join the 2 journeys onto one booking but will still refund me half the avios for inbound. Regarding the tax they said that only once I have flown should I email CS with request for difference in tax refund. They stressed that it is not their policy usually, but only in my situation will they find a way to refund the avios for inbound. CS said I was sensible in booking/blocking the inbound when they came available. 1) My understanding based on the comments here was that it should not be a problem to add inbound. Is that not the case? 2) Do I have any chance in getting difference in tax back? 3) what can I do now? and could I have done any better? Easy to answer the last question: no. *I think* outbound booking is fine on its own online, but to *add* the inbound to the 241 you have to call. Yes, that’s what I always do. There is always a call centre open somewhere around the world, even at 11pm. You can change 241 to a higher class for a fee, but there are risks involved (like someone grabbing seats before the agent and your current seats not going back to award inventory). I had the same issue recently. You First told me that if you book them separately then they don’t add them together to one booking, I had them calculate the taxes and I was actually better off for doing it this way. They don’t refund the tax difference when adding a return leg to a 241. Just half the avios. They will refund the tax when 2xoneway is more than a return. Another reader had this recently and it was corrected when he called back. IME it’s down to the passenger to request. Get a reprice (and refund) for US, not for HKG. Why on earth they can’t just tweak the IT so that the 2 4 1 can be used in 2 halves is beyond me! So what do you suggest I do if a higher class comes available? try call CS or book immediately with Avios and then call CS hoping they will add adjust it to 241? OT: Can you remind me of what you value a Virgin Atlantic mile as? Welcome everyone else’s thoughts as well. Today, less than Avios, purely due to the restricted route network and the lack of a 241 voucher usable in Upper Class (unless you’re Gold). Value is underpinned by the hotel redemptions and the Kaligo.com hotel, however, which give you a floor value of 0.5p+. This may change when Air France / KLM becomes available for redemption. If you are a solo traveller (so no need for a 241) who travels to the US a lot, however, then they are worth the same as Avios. If you never leave Europe, they are worthless for flights. Even as a solo traveller, I still wouldn’t value as high as avios due to having to have a specific plan for them rather than bring able to use them on short haul like avios. Talking of Kaligo, any news on a forthcoming promotion for HFP readers? I’ve got 30 nights I need to book at independent hotels so I’m hoping for sonething useful as tbey are usually on Kaligo. Thanks, not in a rush to book so will look out for that and others coming along. JUST FOR ME they are worth more than Avios. But then JUST FOR ME nearby airports have a decent Virgin route network and not BA,, AND most of my travel is transatlantic AND I prefer Virgin’s product, AND my nearest airport has much better KLM connectivity to Amsterdam than BA to London which may soon be very relevant. Like everything then, it depends :D.
OT I am trying to convert my SPG points to Virgin. However it doesn’t recognise my flying club number so won’t proceed. Any ideas please? You may have already tried this but have you tried ringing them? I tried to send my points to virgin when it was the last day of the old travel packages before the merger and just would not work over the phone. OT re Virgin Redemptions: Redeeming in Economy seems quite bad value right given the taxes. LON to NYC was around £272 in taxes return + 20k miles, not too far off a cash ticket (when ignoring peak / booking in advance). Me and my partner will have c20k points each, and probably could hit the 20k on the free Virgin CC to get 2-4-1 economy or upgrade to PE. I guess the upgrade to PE is the best value option right? Or alternatively transfer to Hilton? I just did a MAN-ATL in Virgin Premium for 25k miles and £430 taxes with an upgrade voucher, thought that was pretty good. Economy redemptions always bad value compared to discount cash ticket. But you have to consider you’re comparing a ticket with some flexability to a discount use or lose. Does flex have value to you? Kaligo can offer some decent hotel redemption with Virgin – although never the same value as redeeming for flights it is generally better than Honors points; Worth comparing to Hilton to see what suits your purposes if you decide on the hotel route. Yes, am planning to look at this again in the next week or so. What is the full special landing page URL? I am planning a trip to Dehli and return via Nepal (KTM) in August. Any bright ideas for Avios/Virgin miles redemption? Both virgin and BA fly direct to Delhi. Availability in all classes should be pretty good for a return flight. Delhi to Kathmandu can be done on Jet airways using Virgin (book over phone). Alternatively book one way outbound to Delhi and return using Avios on Qatar or Cathay from Kathmandu. Cash fares between Delhi and KTM will be cheap. Please be careful booking on Jet Airways given the financial trouble (not paying pilots, delaying their wages) they are in. To help with use of Amex 50 off 200 offer, looking to book a HIX for family of 3. IHG website prices a family room at about £90, with or without child. Amex Travel has something similar BUT only if searching for 2 adults. When I change the search to 2Ad 1Ch, Amex prices up at double that, even though the results still only show ‘1 room’. It appears as though Amex IT can’t handle the family room request so prices for 2 standard rooms. I am minded to book the family room for 2 Adults – to get correct pricing – through Amex, then call the hotel to ask for a child to be added. Also, is it normal for flights through Amex being priced markedly higher than other OTAs / direct with carrier? Amex is cr*p like this. They regularly have rooms in their system flagged with the wrong capacity. There is a suite at Four Seasons Hampshire we always take for the four of us, and Amex’s room description even says it sleeps four. The FS website lets you book it for four. Try to book for four via Amex FHR, however, and it won’t offer it. You need to book for three and then contact the hotel the day before to get the 2nd extra bed put in. No idea why this is the case. Thanks Rob, sounds like a regular Amex glitch. I’ll go with the plan. Those flight times are terrible, you pretty much lose a night going and lose a night coming back, in a Cory where £200 a night is average for something decent. Bits OT: LHR T5 non BA lounges..
Got a couple of hours prior to flight later this week and a PP to use, any current preference between Aspire & Plaza? And personally I’d prefer Gordon Ramsay’s. Or come to think of it, if I didn’t have to work I think I’d almost even prefer to use the Pret on the ground floor. Food options in the Aspire are insultingly low quality. Drinks not much better. Can work at some tables. But it gets rammed due to monopoly market on PP in T5 so don’t even count on that. ps I have an Amex Plat for Plaza, but does it allow me to take in a guest.? Yes, it allows a guest. Thanks all, work colleague will be happy. I guested my work colleague in a few ago. He liked it in there and could see why I used it. Was in T5 B Lounge today. Difficult to find a seat to do some work calls from. Yep free guest with Amex Plat no issue. Hands down Plaza – Aspire is massively overcrowded and rubbish food selection whenever I’ve been in. OT: Got an EasyJet flight coming up from Luton next month for the weekend, recommendations on parking? Ideally want to be close by because land on Sunday at 23.15 and have work next day! I always pre-book the onsite Mid Term Parking (https://www.london-luton.co.uk/parking). If you only have carry-on bags don’t wait for the shuttle bus (unless it’s pouring with rain!) – it only takes five minutes for a brisk walk down the road and through the tunnel to/from the terminal. Footpath all the way, so no problems with the road traffic. Much better value than the pricey Short Term, or the outrageous Multi-Storey parking. Unfortunately even the satisfaction of saving money on your parking can’t compensate for the general experience of using the airport. OT: Anybody experiencing problems adding new cards to Curve? I’ve tried adding my Virgin Atlantic card three times this morning without success. Scrap that, I need to go to Specsavers! Maybe try somewhere else. All the Specsavers near me accept Visa and Mastercard but not Amex!